Brazilian President Dilma Rousseff has won back some of the popularity she lost during the recent social protests in the country, new poll findings revealed on Tuesday. According to the new poll, commissioned by private transport sector lobby CNT, the president’s personal approval rating rose from 49.3 per cent in July to 58 per cent in September. The Brazilian government’s approval rating reached 38.1 per cent in September, up from 31.3 per cent in the previous poll carried out in July, says polling firm MDA Pesquisa. The results confirmed an earlier survey by pollster Datafolha, that the government is slowly regaining confidence among the public. A total of 38.1 per cent of respondents said Rousseff’s administration was doing a good or very good job; 39.7 per cent rated it as regular, and only 21.9 per cent said it was doing a bad or very bad job. As demonstrators took to the streets in June to protests against corruption, transports fares and poor public services, Rousseff had taken swift and critical decisions like pledging more investment in public transport, hiring doctors from abroad and setting aside oil royalties for education. Rousseff had also called for a critical national referendum on political reforms in the country. 63.3 per cent of those polled said the government has attended to some of their complaints, and 42.6 per cent said there have been improvements in the country after the protests. Inflation slowed sharply in July, the economy grew 3.3 per cent year-on-year in the second quarter of 2013, and several states rolled back transport fare hikes. 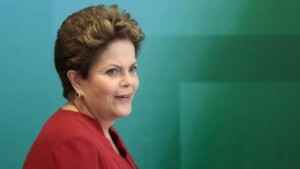 A total of 36.4 per cent said they would vote for Rousseff, up from 33.4 per cent in July. The survey involving 2,002 voters in 135 cities throughout Brazil was carried out between August 31 and September 4, and has a two- point margin of error.